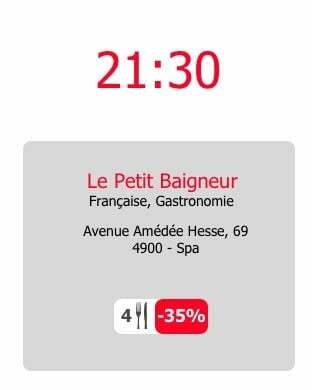 Resto Minute is the #1 application dedicated to help you find dining deals in Belgium! RestoMinute offers last minute deals up to 50% off your bill on a selection of the best restaurants in Belgium. Every day, Resto Minute offers you up to 50% off your bill on a selection of best restaurants ! Are you a foodie ? 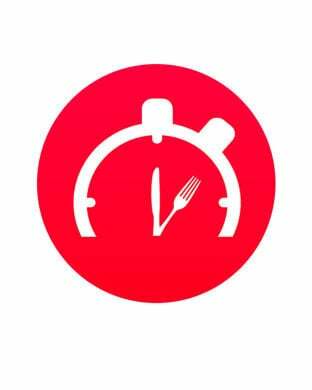 Download the Resto Minute app now ! Last minute reservations : enjoy reductions up to 50% on your bill ! • Discover last minute offers close to you. • Quickly view all available restaurants, the reduction, the setting, the location on the map and prices. • Book your table for free in a matter of seconds. • Stay informed about exclusive promotions and excellent deals. The Resto Minute restaurant reservation website lets you book tables at restaurants across Belgium, at a discount, without having to pick up the phone. Let me know if this sounds familiar: You had big plans to cook a nice dinner but you’ve worked all day and the last thing you feel like doing is being creative in the kitchen. You’re sick of the usual take-away and delivery options and think it would be nice to go out to a restaurant. The last thing you want to do however, is wander around looking for a restaurant with a free table on a busy evening. If this situation rings a bell, you need to check out the Resto Minute restaurant reservation website. Resto Minute is a reservation engine for restaurants, with one important difference – you can only reserve for the current evening. At a glance, you can see how many tables are available at your chosen restaurant. Simply click ‘Book’ and you’re on your way. The best news – restaurants offering tables on Resto Minute do so at a discount. You get a reduction of 10-40% off your bill (excluding drinks, set menus, or other offers) simply for booking through the website. Rest Last Minute is also great for those of us who want to try somewhere new, but need a little inspiration. When you click on a restaurant’s booking page, you can see sample menu items (with prices), photos of the interior and some of the dishes, a map of the restaurant’s location, and even the link to click through to its website, if you need more information. You can refine your search by location, type of cuisine, or, if you know exactly where you want to eat, you can search by Restaurant name as well. Wednesday morning, I visited the Resto Last Minute website and had plenty of options to choose from. There are many Brussels ‘institutions’ as well as restaurants I’m not (yet) familiar with. You can even book the Brussels Tram Experience through the website. As for Resto Minute, we will definitely be using the website again. There were plenty of restaurants to choose from, the discounts are a great incentive, and it’s nice not having to call a restaurant and speak (in French or Dutch) with a harried server who may or may not get the booking right (especially when you have a last name like ours! ).